You’re My Little Sweet Pea is a heartwarming board book about the deep bond between a parent, grandparent, or any loved one and their little one. 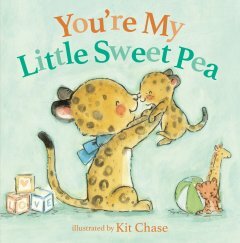 The sweet rhymes and adorable illustrations by Kit Chase help show all the wonderful moments shared with a child, reminding children how special they are and how much they are loved. Little Sweet Pea, I love you. From button nose to baby coo. Squishy cheeks and sparkly eyes, Pure delight and perfect size. Tender feet and tiny toes, Where they’ll take you, no one knows. If you love books from authors like Nancy Tillman (On the Night You Were Born) and Sam McBratney (Guess How Much I Love You), then You’re My Little Sweet Pea is the perfect book for you.